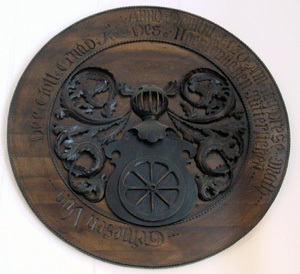 In many German churches there are circular mediaeval wall tablets, depicting a coat of arms with a memorial inscription; they are real church monuments, not funeral paraphernalia like English hatchments. They were often set up in conjunction with a floor slab, and are usually called Epitaphien, “memorials above the tomb”. These two examples were salvaged from the ruins of Königsberg Cathedral, which was burnt out in 1945, and remained exposed to the elements for sixty years before being restored; they are now displayed in the museum rooms in the south tower. Each one shows a shield of arms, with helmet and crest, and very elaborately carved mantling. The work is delicately done, in lime or some such close-grained wood, and although they are broken, and the backing boards mostly lost, they do not appear to have suffered from fire or water. These are the beginning of a tradition which was to flourish in the early modern period, as ever larger and more and more elaborate Epitaphien appeared all over the walls of many Baltic churches, some with painted figures of the family of the deceased kneeling in rows. 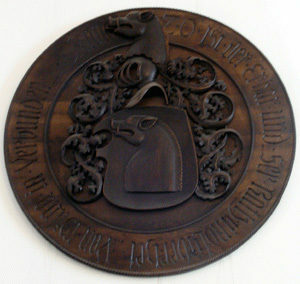 They continued to be made into the nineteenth century, the inscriptions nearly always in German, though there is one in Russian in the Castle Museum in Rīga. These two are all that remain of many that were once in Königsberg, to judge by old photographs. But Königsberg, which was once the capital of Prussia, was very severely damaged in the second world war, and the population of the entire province was exterminated. It was resettled with Russians, and renamed Kaliningrad for no better reason than that Marshal Kalinin happened to die just as they were debating what to call the new city. For decades it was a closed city, being an important strategic base, but now left behind as a tidal pool of history, inhabited only by rather melancholy displaced Russians. For their regular worship the people throng to the new Orthodox churches, and they have no use for a Gothic Lutheran cathedral, but the building is re-roofed and restored as a concert hall, with tiny Orthodox and Lutheran chapels in the bases of the towers. While they are obviously concerned about the remaining artefacts from the Cathedral, including its church monuments, it is rather too late to salvage more than fragments such as these. 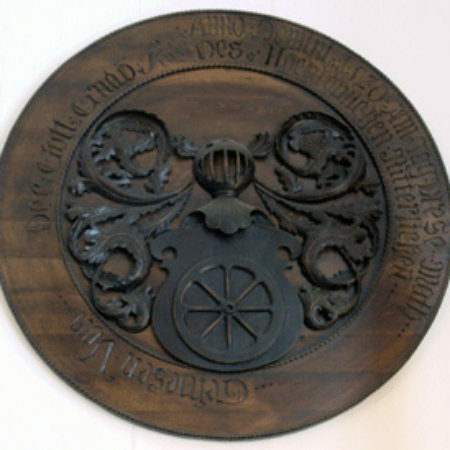 The first one is to Gesueren von ---, 1520; the shield bears a wheel, the crest is missing; it is set on a replacement circular board with an incised inscription in Fraktur, Anno Domini 1520 Am Tag Diese Math --- --- Gesueren Von --- --- den Gott Gnad --- Des Hochlaystelzen Ritterließen ---. 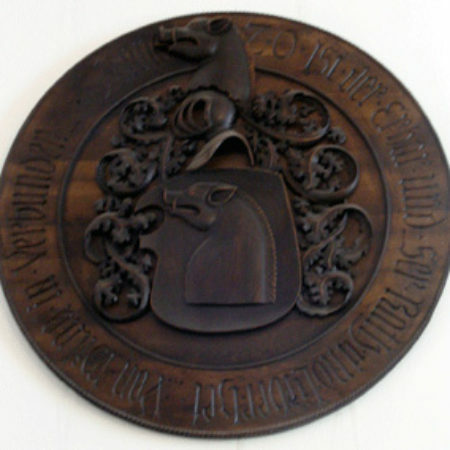 The second, to --- von Wilma, 1520, has both shield and crest of a boar’s head, set on a replacement circular board (except for the top dexter area which is original), with an incised inscription in Fraktur: Anno 20 Ist der Erbar und ser Rath und Lieberhet Von Wilma in Verbunden. The inscriptions were presumably copied from a pre-war source, the Gesueren one already damaged or illegible in parts.